Nancy Horwood’s mother has struggled with Parkinson’s Disease for 25 years — medications that don’t work, painful falls, and bills that pile one on top of the other. Though she knows a cure can’t help her mother, Nancy wrote this letter to a Pfizer scientist studying Parkinson’s in Cambridge with the hope she could one day tell her mother a cure will help others. I am writing today to tell you the story of my mother, Helen Sokolosky, and her 25-year battle with Parkinson’s Disease. The first time I noticed anything different about mom was on August 7, 1993: my wedding day. As I prepared to walk down the aisle, I looked in front of me and noticed my beautifully dressed mother slouching. I recall asking her to stand up straight to which she replied, “I am standing up straight.” I didn’t know it at the time, but her change in posture was one of the first signs that she had Parkinson’s Disease. 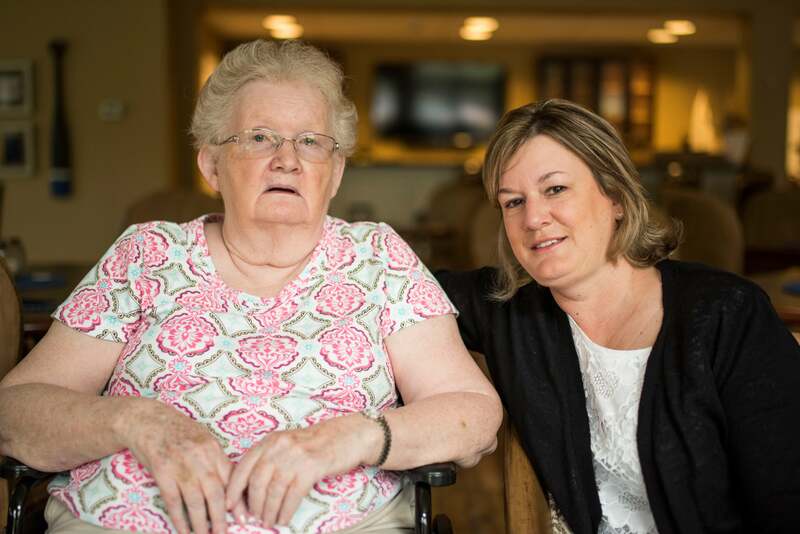 Nancy Horwood (right) sits with her mother, Helen, at her assisted living facility. Mom’s Parkinson’s progressed relatively slowly for many years until she was diagnosed with breast cancer and underwent radiation treatment. After that, her Parkinson’s symptoms seemed to accelerate. She started having increased problems with balance. She fell numerous times and was sometimes hospitalized for short stays. This took an extreme emotional and physical toll on her, but she persevered. My father, however, was becoming increasingly angry and frustrated about what mom was enduring. He felt helpless that he was unable to stop the inevitable. As the disease continued to take its toll on Mom, she began to spend more and more time at home. She tired easily and weakness on her left side caused her foot to drag, further increasing her risk for falls and necessitating the use of a walker. Her body became more and more rigid, making it difficult to complete basic everyday tasks on her own. One of the most difficult challenges for both my parents was Mom’s gradual inability to hold her urine. She began to avoid social situations, stopped traveling to visit her children and grandchildren, no longer vacationed with friends, and ultimately became more and more isolated. The incontinence made it impossible for my mother, and therefore my father, to sleep through the night. She needed assistance getting in and out of bed, and if the bedding needed to be changed that responsibility fell on my dad. My father began to take on more and more responsibility in the house: shopping, errands, cleaning, laundry etc. He loved our mother dearly and could not have been more devoted to her, but his exhaustion was evident. When my sisters and I visited our parents, we no longer spent time doing the normal things families do when they get together. Instead we helped catch up on the chores around the house that our father was not able to keep up with. This new reversal of roles, children as caregivers, was one of the most difficult adjustments for us as a family. In March of 2014, things took a turn for the worse when Mom tried to rise from a chair at the kitchen table and took a terrible fall that shattered her entire back. Falls due to orthostatic hypotension had become an increasingly prevalent symptom of her illness, but this fall changed everything. After undergoing extensive surgery, my sisters and I took turns spending time with her around the clock while she began to heal, but, unfortunately, things only got worse. My sister called me to tell me my father had just had a heart attack. Two parents in two different hospitals facing very serious health issues led us to our breaking point. We knew our parents could not continue to live in their home and difficult decisions would need to be made. While Mom recuperated in a rehabilitation hospital, we began to transition Dad to an assisted living residence where we hoped Mom would eventually join him. It was only a couple of weeks later that Dad began to cough and was soon diagnosed with pneumonia. The next few weeks are a blur, but Dad was ultimately unable to fight the pneumonia, and after 10 days on a ventilator, we made the heart-wrenching decision to say goodbye. It is my firm belief that Parkinson’s Disease not only destroyed my mother’s life, but also took my father’s. My sisters and I promised our father we would continue to care for our mother in a way that would make him proud. With money from their estate and his life insurance, we have been fortunate to able to pay for Mom to reside in an assisted living residence where she receives around the clock care. The cost is exorbitant, however, and we worry constantly about what will happen to her when the money runs out. This is the reality of caring for a patient with Parkinson’s Disease: there is no help. Parkinson’s Disease was not just a diagnosis for my mother; it was a diagnosis that redefined our entire family. 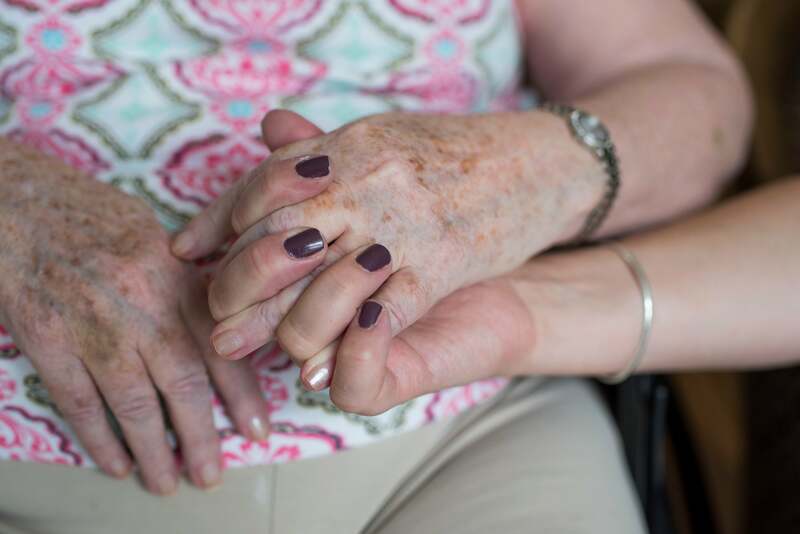 It’s a disease that stole my mother’s independence, her ability to walk, time with her friends and grandchildren, opportunities to travel and enjoy retirement, and even her ability to smile and smell. Due to her slowed movement and rigid muscles, my mother struggles to get out of bed, get dressed, shower, cut her food, speak clearly, and write legibly. The money from the home my parents worked so hard for is being whittled away to care for her needs; she will never enjoy a cent of it. Her care has consumed our lives for the past 25 years and, I believe, ultimately led to the death of my father. My family’s story is only one of thousands, and the struggles I’ve described can only provide a snapshot of the heartbreak and pain, mental and physical, my mother has endured. Although a cure could not replace the years my mother has lost, it will prevent other families from enduring the same agony. I implore you to continue the important work you are doing to eradicate this debilitating disease. 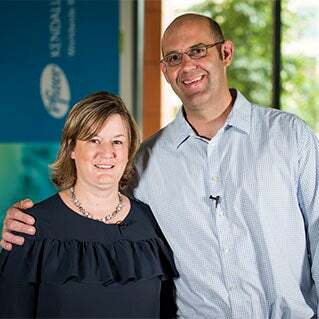 Read Nancy’s story and watch her meeting with scientist David Gray.